For 48 years, dedicated volunteers have coordinated the Annual Greater Hartford St. Patrick's Day Parade. Besides widespread local print and broadcast media coverage, their efforts help draw an average of 40,000 parade participants and spectators into the City of Hartford on Parade Day. With this attendance, the parade has become one of the largest annual crowd-attracting events for the City of Hartford. 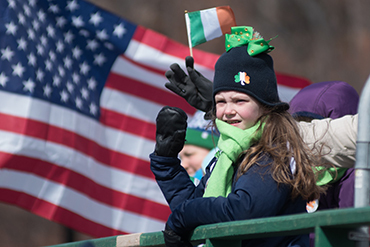 While a well-defined Irish and Irish-American population segment are present as parade participants, the viewers comprise a broad demographic. The demographic not only celebrates St. Patrick, but also the diversity of the Greater Hartford and Southern New England area. We invite you to share in our high-profile event as a Sponsor. There are several levels of sponsorship available that allow marketing and positioning of your services or company throughout the Greater Hartford community and Southern New England.